Join a new Christmas Rave. Read Christmas different. Enjoy CHRISTMAS REEL. This imaginative collection of ten unique Christmas short stories totally rocks unconventional Christmas. CHRISTMAS REEL chemistry evolves between unusual characters, intriguing interactions and the extraordinary events that connect them. CHRISTMAS REEL will take you from wreaths, trees and angels to flying giant birds, motorcycles, mysterious toys and magic elixirs. But, true to the season, they all have happy Christmas endings. CHRISTMAS REEL explores love and uncommon discoveries as they happen during the world’s most celebrated time of the year. And, because new Christmas begins as soon as current Christmas ends, CHRISTMAS REEL remains real all year long. Follow the CHRISTMAS REEL trend, share the moving impact of seasonal slants and discover how exciting Christmas can be. 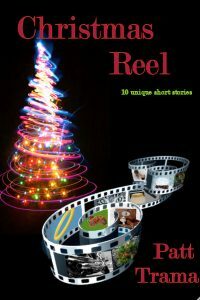 Get a feel for the CHRISTMAS REEL and get the new Christmas read on. CHRISTMAS REEL books the perfect gift. Buy it, try it and have a continuous Merry Christmas. This is the second book by Patt. More to come. Check back soon!